Have you ever heard of Joe Gandolfo? He's the only guy in the history of the world to sell a billion dollars worth of life insurance in one year. A BILLION in an industry whose members aspire to qualify for the Million Dollar Round Table. Have you ever heard of Joe Girard? He sold 13,000 cars in 15 years. That's an average of 2.4 cars a day, every day, 365 days a years for 15 years straight! Kind of makes the guys that are selling 50-100 cars a year look like losers, doesn't it? Yesterday was the last day of the month for two salespeople I know. Both have a $4,100 quota. One did $4,300. One did $9,000. One of their coworkers just hit their quota for the year ($4,300 x 12 = $51,600) which means they've averaged almost $13K/month. Did they sandbag from last year? Probably not because they did over $24K in December of 2016. I intentionally haven't mentioned all their coworkers that sold less than $4,100 and missed their quota. What is an eff'in sales quota anyway? Does it have anything to do with your life? Why do 40% of salespeople miss their quota? Some barely make it, while others double or smash their quota by 6x? How do you get a quota? How does this sound? A bunch of smart executives have a great business idea. They get financing. They set a company sales goal of a billion dollars and decide that a good salesperson should sell $1,000,000. So, the company needs to have 1,000 salespeople sell $1M (average) each to get $1B. However, when the executives realize that 75% of salespeople don't know what the heck they're doing and as a result 40% of salespeople miss their quota they hire 1,667 salespeople because 60% x 1,667 x $1M is still $1B. Quotas allow sales managers to report that 80% of their salespeople are achieving 75% of their quota and the executives are happy because even though salespeople are missing quota, the company is hitting its number. Seriously? Moreover, because so many salespeople focus on company metrics and minimum behaviors to achieve quota, more often than not, salespeople find themselves in the last few days of the month and they need 1, 2, 3 more sales to get that magical number that will make his sales manager and the manager's manager and the CEO say, "Attaboy!" So, what if salespeople didn't focus on the company provided quota? What if they tried to figure out what they were capable of? What if they had their own dream? What if they used their own metrics? What if they were ready for obstacles? What if they had a plan and worked their plan? What if 2x, 3x, 6x became their norm? What if salespeople could reach their own goals as well as helping their company reach its goals? Think about this map and it's relevance to what you might be capable of doing if you changed your mindset. 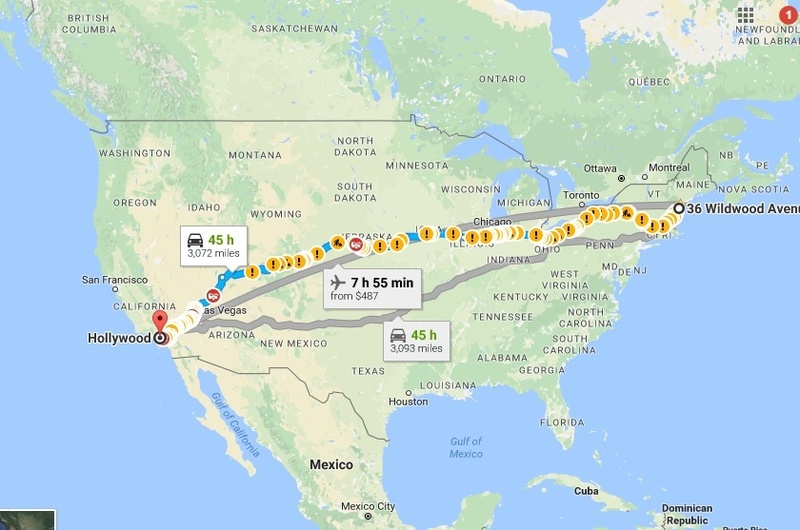 It's over 3,000 miles from my house to Hollywood and I, according to Google Maps, could walk it in about 1,000 hours. I could fly in about 8 hours or I could drive in about 45 hours. If I drive, look at all of the yellow traffic incidents and construction zones and red accidents that are on my route. I won't be able to drive 45 hours straight. How long will I drive between breaks? What if I have a flat tire or my car overheats? What if I come to a detour? How much gas will I need? I don't know the answers to all of these questions. I don't even know if I've anticipated all the questions? Regardless, even though I've never driven from my house to Hollywood, and even though I can't see Hollywood from my house, I'm pretty sure that I can drive there and I'll deal with the obstacles and detours as they arise. What dream are you suppressing? What would it take to make 2019 the best year of your life? What would make your spouse smile? What would make your family or coworkers take notice? As you can tell, I have a special relationship with our clients. It's not too late. Start your journey today.